An unusual, small, Wedgwood majolica dish. This piece has an impressed 'WEDGWOOD' mark and it is also impressed with the letters 'GVK'. This is the date code for the year c.1882. There are also two impressed workman's marks in the shape of stars and the letters 'PX' are painted in red enamel. 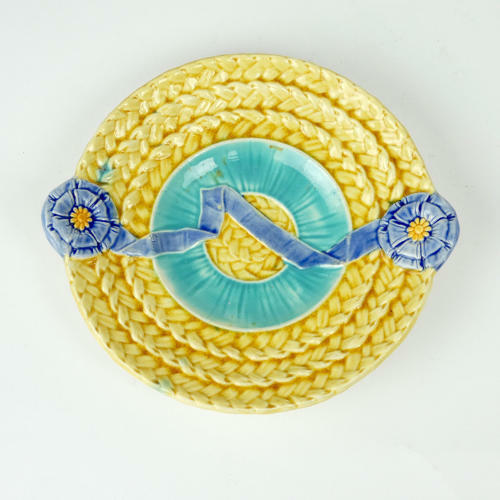 The dish is moulded with blue rosettes and a ribbon on a yellow and turquoise basket weave background. The overall effect is very attractive and the piece is in perfect condition.